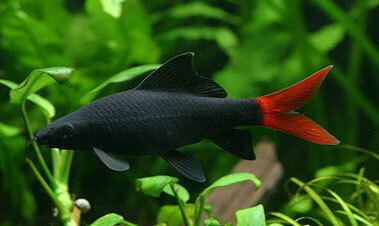 Today I want to write about redtailed black sharks because I like their very bright tails. These beautiful little fish grow up to 16 cm long. The males are more brightly coloured than the females. Despite their name, they aren’t really sharks, but are more closely related to carp. They swim near the bottom of the water and eat plant matter and very small animals. At breeding time, the females spawn eggs that hatch after just a few days. The babies can swim freely after 3-4 days and start to gain the markings of the adults after 7-10 weeks. At one stage, it was thought that the redtailed black shark was extinct in the wild, but they have recently been rediscovered in a small area in Thailand. They are a very common aquarium fish, although they can be very aggressive with other fish. Are there any other interesting facts that you would like to share about redtailed black sharks? I have a red tailed shark and I’m finding a dead fish in my tank every other day . While watching the fish I noticed that this particular fish is the only aggressive fish in the tank .however I have three silver dollar and several small tetras species .